Now in its ninth year, SPS IPC Drives Italia keeps riding the crest of the digital revolution in industry with its dedication to the cutting-edge automation technology, robotics, and mechatronics that are feeding the rise of smart factories and Industry 4.0. After the great success of last autumn’s show in Nuremberg, Germany, Wibu-Systems is returning to Parma with its own exhibition space at booth A002 in hall 7. As the technology leader for license lifecycle management of 30 years’ standing, Wibu-Systems has developed a complete ecosystem of hardware, software, and cloud-based solutions. With multi-platform support and full interoperability of its secure elements, Wibu-Systems’ technology protects the integrity of digital assets, technical know-how, and other intellectual property from piracy, reverse engineering, tampering, and cyber-attacks. CodeMeter, the flagship technology of Wibu-Systems, encrypts and protects software, firmware, and sensitive data with highly sophisticated methods and algorithms. The digital transformation has created a mindset shift among mechanical engineers, moving away from the highly specialized machines of yesterday to software enabled customizations of today. With features and functions governed by software, the capabilities of machines can be activated or adjusted at the press of a button. The relationship between producer and client is changing with this new freedom, and CodeMeter is the right tool to create the perfect relationship with the modular and scalable business models it allows for any need in the market. CodeMeter supports traditional PC systems, mobile and embedded devices, PLCs, and microcontrollers. It integrates effortlessly with existing back-office processes and ERP, CRM, and e-commerce platforms – another of its essential qualities when it comes to boosting business performance and reducing the cost of logistics. CodeMeter Certificate Vault: The newest member of the CodeMeter family functions as a token provider that is fully compliant with PKCS#11, integrates as a KSP (Key Storage Provider) for the Microsoft Cryptographic Next Generation (CNG) API, and works with the OpenSSL API to store and use e.g. the private keys of Transport Layer Security (TLS). CodeMeter License Central, the database-driven platform for creating and managing licenses via the cloud, creates the key pairs and certificates and sends them to the user as a WibuCmRaU file, encrypted with the client CmContainer’s public key and therefore usable by the right client. This novel approach turns the creation and assignment of certificates into a simple push operation, making it the perfect choice for remote devices in the industrial field, for IoT systems, or simply for encrypted emails or secure client VPNs in industry. Any third-party application can access the CodeMeter-protected keys and certificates in line with the PKI standards, with the necessary cryptographic operations happening in the local device. The certificate creation process can also be used via SOAP with existing Certificate Authority (CA) solutions. IP protection for Siemens TIA Portal® (Totally Integrated Automation Portal): Engineers using the architecture can assign specific roles to their teams, protect the IP of their projects, and control access to invaluable resources with a solution built around a hardware secure element (CmDongle). CodeMeter License Central works as the interface between CodeMeter Keyring Password Manager, the user, rights, and password management module, and CodeMeter Keyring for TIA Portal Password Provider, the link between the CodeMeter technology and the TIA Portal. Combining Trusted Execution Environments (TEE) like Trusted Platform Modules and Intel’s SGX technology with CodeMeter: By linking CodeMeter with Intel SGX’s native memory enclaves, originally intended to keep binary code in encrypted form in the RAM, software developers can not only avail themselves of the hidden RAM enclaves to keep their sensitive data, but also use a special extension of that enclave. The secure memory area on their devices prevents debugging and other code tampering in memory and provides another tough shield to protect the memory itself. The place to be this year is our booth A002, hall 7, where you can link up with some of our leading specialists and explore where the industry is heading, what the future holds, and what Wibu-Systems and you can achieve for your business. Our experts are also offering a workshop on “Secure Digital Key Storage and Key Enrollment in Industrial Environments”. Cryptographic keys and digital certificates are essential to securely identify machines and devices and to protect M2M communication, but the complex processes needed until now to manage and store them have made them less popular than they ought to be in the field. CodeMeter generates and stores keys securely on computers and PLCs with a fully scalable approach that can go from a simple and resource-friendly software solution to a more sophisticated setup using hardware secure elements. With CodeMeter, the necessary keys and certificates are assigned from one central server, with a user-friendly registration process designed to work seamlessly with your rights and entitlement management. Many of the exhibitors on show have already opted for CodeMeter because of the sheer versatility of the technology, the scalability of the solution, its long-term availability, and the unrivalled ease of use. Be it a retrofit or a completely redesigned architecture: any project should aim for security by default and monetization by design. 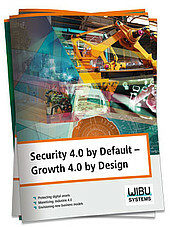 Download the publication “Security 4.0 By Default – Growth 4.0 By Design” to discover who has already partnered up with Wibu-Systems.